Part of the show Why Is Ice Slippery? Well, with fly spray, which is the stuff you spray on nuisance flies - usually there's a short lag and then, suddenly, the fly appears to go nuts: it speeds up its activity and then all of its movements appear to become very chaotic. Then, usually, it ends up laying on its back with its legs writhing in the air, buzzing furiously before it just expires. This enzyme is very important for interrupting the flow of information between motor nerves and muscles. The nerves squirt out a nerve transmitter chemical called acetylcholine. This binds to special docking stations called receptors, which are on the muscle and activate the muscle. You terminate the signal by breaking down the acetylcholine with this acetylcholinesterase enzyme. 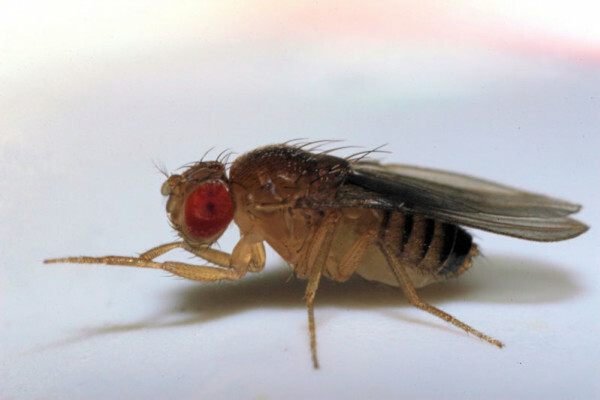 If you inhibit the enzyme with drugs or the chemicals that are in the fly spray, what happens is that you end up stimulating the muscles too much, you don't interrupt the signal and, as a result, the fly's muscles all go into tetany - they're contracting all the time and as a result, the fly becomes nonviable and also can't move its abdomen backwards and forwards to move air in and out of its body, so it can't oxygenate its haemocele, the bag of blood inside the fly; so it basically asphyxiates as well. Previous Do bananas brown faster in the fridge? Next Can we use moonlight to start a fire? Does Earth's rotation affect flight times?